STAPLE! donates $1,000 to the Comic Book Legal Defense Fund. STAPLE! The Independent Media Expo, Texas’ first independent and small-press comics, zines and arts convention, recently donated $1,000 to the Comic Book Legal Defense Fund. 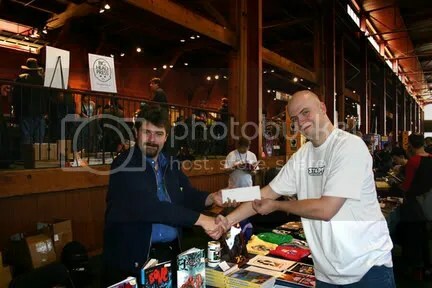 The check was delivered by Nate Southard, one of the show’s organizers, during the Alternative Press Expo in San Francisco to Charles Brownstein, Executive Director of the CBLDF. CBLDF Executive Director Charles Brownstein (L) receives a check from STAPLE! organizer Nate Southard.